What’s all the chirping about Twitter? A little (blue) birdy said that changes are coming. There are always mixed feeling when it comes to any social media platform establishing new rules, and Twitter is no different. As marketers, we know that the social media realm and its rules change faster than a chameleon changes color and, that’s only half the battle. With every change in rules comes a change in an organization’s social media strategy. The new Twitter rules will certainly change your strategy, but in a good way. Here’s how. If you have ever tried to write a tweet that includes images, links, videos, or shout-outs to other Twitter users, then you know how frustrating it can be to keep your message within the character limit. Although the allure of Twitter has always been its quick, conversation-like feel, having media count toward your character limit has made it difficult when deciding what to say. Now Twitter has relieved that stress, well relieving-ish. Media like pictures and GIFs will no longer count toward the 140-character limit. So go ahead, add that cute cat GIF. Finally making good on their word from almost a year ago, Twitter has removed @names from your 140 character limit for tweets. Now when you want to reply, simply choose who you are replying to from the menu, and the user handles are then put above the message field — making it similar to email. You can reply to as many as 50 users too, if you were wondering. Seeking out the best content to retweet can be a vital part of your social media marketing strategy —now that content can be your own. Previously, Twitter rules didn’t give you the option to retweet your own content, which made sense for most people. For marketers however, keeping your best piece of content in the forefront of your consumer’s mind is important. So, when you have a tweet that has more favorites, retweets, and replies, you can use it again when you need some quick and relevant content —relevant being the key. You don’t want to just retweet yourself all willy-nilly. Like any piece of content that you decide to reuse, make sure that it makes sense to use it and that you haven’t used it too recently. However, Twitter wanted to change that. The social media platform said tweets which start with a user name will be seen by all of your followers instead of just that particular user's handle. Yet, the new update shows no resolution to this problem. Maybe someday, Twitter. Although this change (if it ever takes place) won’t affect marketers as much as the other two rule changes will, it will allow you to view all of the conversation that is taking place around a certain brand, Twitter handle, or topic. 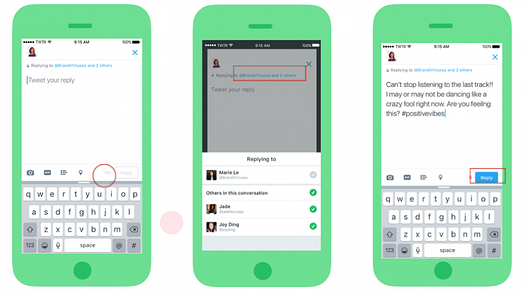 Twitter promises that improvements aren’t stopping there. In their announcement of the new rules, they stated that they are in the process of bringing more fun and exciting changes down the road — while still keeping it the best place for live conversations on the web. To quickly take advantage of the changes Twitter is rolling out, get a new strategy in place now. After all, the early bird catches the worm.